Prepare and serve right from your crock pot for easy prep and clean up. Spray crockery pot of slow cooker with nonstick cooking spray; set aside. In a small bowl, mix together mozzarella, ricotta, parmesan, egg, oregano and garlic powder. Spread 2 T of pasta sauce in bottom of pot. Sprinkle 1/2 of the zucchini over sauce and top with 1/3 of the cheese mixture. Break 2 noodles into pieces to cover the cheese. Spread 2 T of sauce and then layer 1/2 of the spinach and 1/2 of the mushrooms. Repeat layering, ending with cheese and the remaining sauce. Firmly press ingredients into pot. Cover and cook over low heat for 4-5 hours. 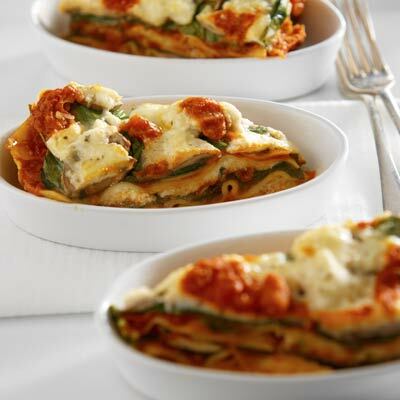 Allow lasagna to rest 20 minutes before cutting into wedges to serve. Spoon a little extra sauce over each serving and top with a basil leaf if desired.